Coach Jim Larrañaga’s 15th-ranked Hurricanes entered a battle of unbeatens coming off a South Alabama game in which they allowed 54 second-half points. Illinois came to the BankUnited Canter fifth in the country with 90 points per game. 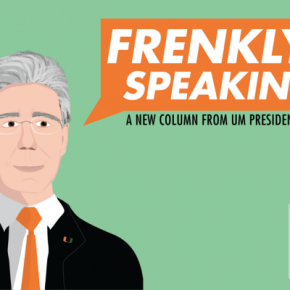 Larrañaga’s defense cranked up the sound a notch as they held the 24th-ranked Fighting Illini to 24 points in the second half. Illinois then came out of the locker room with a 10-0 run to cut the lead to three. So the wizards of the BUC changed their gameplan from outside sharpshooters to an old-fashioned inside attack, and it worked. Illinois had led only once the entire night, on the first points of the night from guard Ahmad Starks’ three. The Canes led the rest of the way en route to a 70-61 win in Coral Gables. The transition from an anemic defensive week to holding a 90-point team to 61 came through motivation and defense during practice. 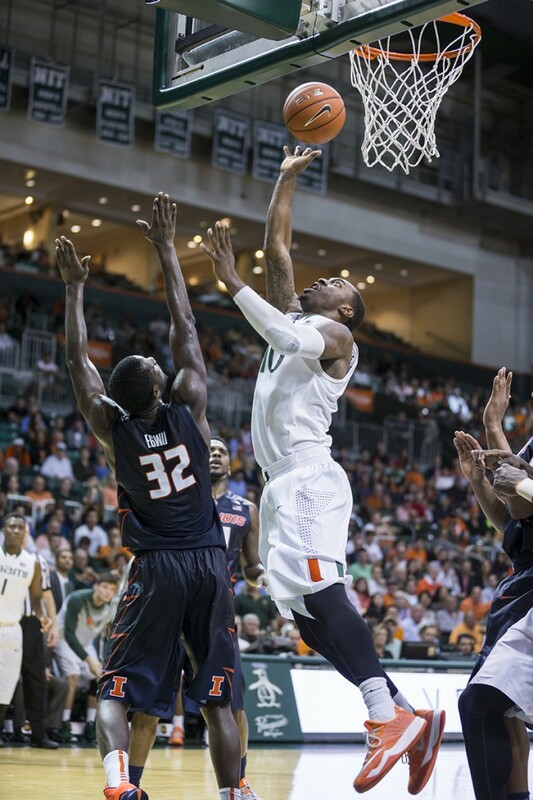 “I told the team before the game…you gotta get stops,” Larrañaga said. “If you can’t stop a team that’s averaging 90 points a game, they can get 90 on you, 95.” Illinois racked up 114 points on November 16 against Coppin State. For redshirt freshman DeAndre Burnett, who had a banner night in his young Hurricanes career with 19 points (7/16 from the floor,) he felt as though Larrañaga was the little man on his shoulder throughout the game defensively. The festive atmosphere at the BUC, with the student section donning orange Santa hats, was momentarily soured when the Illini continued to cut their double-digit deficit down to as little as three in the second half, reminding many of a nail-biting 2013 NCAA tournament game between these two teams: a 63-59 Miami victory in Austin, Texas. Larrañaga called a timeout early in the half to temper that run. Sophomore Manu Lecomte followed Burnett’s night with 15 points of his own, followed by McClellan’s 14. Illinois’s Rayvonte Rice led both teams with 22 points. McClellan, the redshirt junior transfer from Texas, was thrilled with the unblemished start they’ve had. The 8-0 Miami Hurricanes face the Wisconsin-Green Bay Phoenix 2 p.m. Saturday at the BUC. The loss slides Illinois to 6-1 on their way back to Champaign, Illinois.